Getting your accounting fundamentals in place is the key to being right the first time. The course is designed to help you understand the basics in accounting, its principles, general ledger process and prepare a bank reconciliation statement. 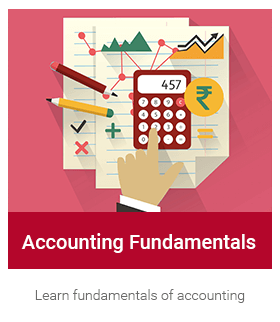 The Accounting fundamental course strengthens your foundation in accounts in just 5 exciting levels. Master the world of accounting using critical thinking and pattern finding tools. Understand the business need and apply accounting knowledge. Organize the different accounts and sub accounts in General Ledger to take care of current and future requirements, factoring in the industry type & complexity of business. Focus of the coding system should be on uniformity, uniqueness, scalability and flexibility. Since accounting is the language of business, understand the guiding principles, concepts and conventions that ensure that the language is understood and applied universally across the world of business. Learn the various ways of journal entry preparation and processing, leading to Report generation and extracting GL dump. Understand conceptual underpinning with a flavour of how the process would be rendered using tools. Understand cash book and its relevance in the world where more and more transactions happen electronically. Structure approach to reconciling Bank and Cash – understanding the nuances, tips and tricks. We offer a scenario-based online course packed with whiteboard videos, interactive quizzes, programs, methods to avoid errors and alternative process to get your fundamentals in accounts right.